Kunekune pigs are the coolest pigs in the world. One of the most popular breeds of animals on Warwickz Farm with our visitors, especially those from overseas are our Kunekune pigs. Robbie and Rosie delight their new friends with their friendliness and laid back approach to life and now are proud parents of six captivating piglets so we thought that in view of it being the Chinese Year of the Pig we would celebrate the occassion with a page dedicated to the Kunekune breed. 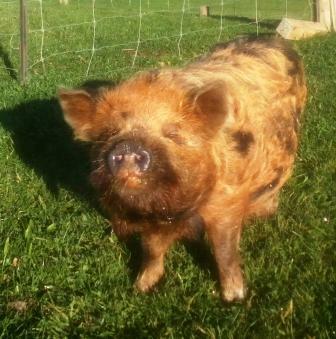 Regarded as a unique native breed of New Zealand the Kunekune which is Maori for plump plump, in all probability arrived with whalers in the 1840s and genetic studies have shown it is related to pigs in Asia. They soon became valued by Maori for the abundance of body fat that was used in food preservation. Close to extinction by the 1970s a dedicated small group of animal conservationists gathered what breeding stock that could be found and established the New Zealand Kunekune Breeders Association and thus the breed was preserved. Kunekune numbers in New Zealand are now very healthy numbering many thousands and the breed can now be found in the United Kingdon, Europe and North America where they are on display in the San Francisco and Atlanta zoos. Kunekunes vary in size shape and colouring but essentially they are round bellied, short snouted, low legged and hairy with 2 tassells (piripiri) hanging from their lower jaws. Robbie and Rosie are regarded as miniature Kunekunes however miniatures are not a sub breed but rather the result of the selective breeding of smaller pigs. The most endearing feature of Kunekune pigs are there sweet natures. Like a loyal dog they come when called and often when not and are always pleased to be with you and share your company (treats or not). These intelligent creatures can even be taught tricks and some have been known to "go fetch"
Our new piglets have a certain claim to fame, their great aunty features on one the New Zealand postage stamp sets celebrating the Year of the Pig. 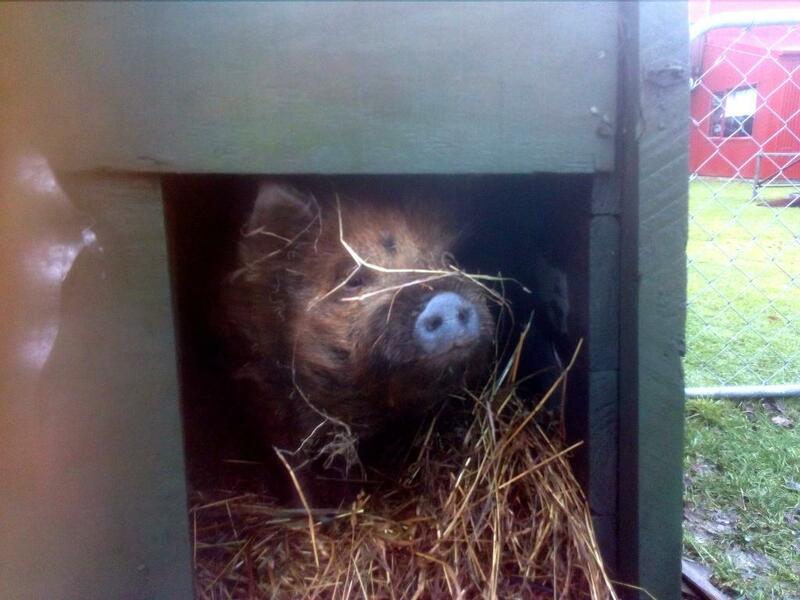 We have just welcomed Teeka a new member (September 2018) to our Kunekune family. This sweet natured redhead has a great pedigree and as well as being a willing guest greeter/grunter she will enhance our breeding programme.